Every play was important but none hurt the Cardinals worse than this punt block with the score still tied 10-10 in the 4th quarter. This allowed Skiatook to kick a field goal for the final difference in the score. Sam West (#13) has taken a Seth Boomer pass into Skiatook territory on the opening possession of the game. As Sam was tackled the Skiatook player (#81) wrestled the ball away ... before Sam's knees touched the ground according to the refs (Channel 6 video and Collinsville coaches and fans disagreed). Skiatook took over at their own 48 yard line with 10:05 left in the first quarter. Collinsville's defense held Skiatook on their 1st and 2nd possessions but started the following Cardinal possessions at the 12 and 4 yard lines after Skiatook punts. Sheaffer Smith (#25) takes a handoff from QB Seth Boomer deep in Collinsville territory near the end of the first quarter. A few representatives of Collinsville's 5-Time State Championship teams were recognized at the end of the 1st quarter. A few other were busy playing a football game. On the first play of the 2nd quarter Sheaffer Smith (#25) had the ball punched out from behind and Skiatook recovered at the Collinsville 23 yard line. The Cardinal defense held the Bulldogs to a field goal at 10:19 in the 2nd quarter and the first points of the game for either team. QB Seth Boomer with three split receivers in the second quarter. Connor Cross (#79) hiking the ball in 2nd quarter action. In the closing minutes of the first half Collinsville was pinned deep by a Skiatook punt to the 11 yard line. Collinsville failed to get a first down and this Austin Roberts punt (on 4th and 12 from the 9) gave Skiatook the ball at Collinsville's 36 yard line with 43.8 second left in the half. Skiatook scored their only touchdown on this 30 yard pass with just 10.5 seconds left before the half. Their kick was good for a 0-10 lead. Returning Skiatook's kickoff Sheaffer Smith (#25) had cleared all but the last defender and got past that man but lost his balance in the process and went down at the Bulldog's 28 yard line with just 2.5 seconds left in the first half. A Skiatook offside used all but .6 seconds before this final play of the first half from the 25 yard line. Skiatook intercepted and then returned the ball near midfield with time expired. The Collinsville Cheerleaders performed at half time as a warm up for their Saturday Regional at Bixby. Following the initial rain/lightning delay the weather was mostly dry with just occasional sprinkles. The Collinsville Crimson Cadets had their uniforms on for this 3rd game of the season home opener. Brandon Lowe (#2) stopped Skiatook's 2nd half opening drive with an interception at the Collinsville 30 with 9:14 left in the 3rd quarter. Following Lowe's interception Collinsville drove down to Skiatook's 8 yard line before settling for Cole Hadley's (#8) field goal at the 2:12 mark of the 3rd quarter and a 3-10 score. On the first play of the 4th quarter (from the 31 yard line) Skiatook had the ball on the ground (above) between the center and QB which was knocked around a bit before being picked up below. Josh Arnold (#43) finally scooped up the ball and took it to the endzone but no touchdown was allowed. 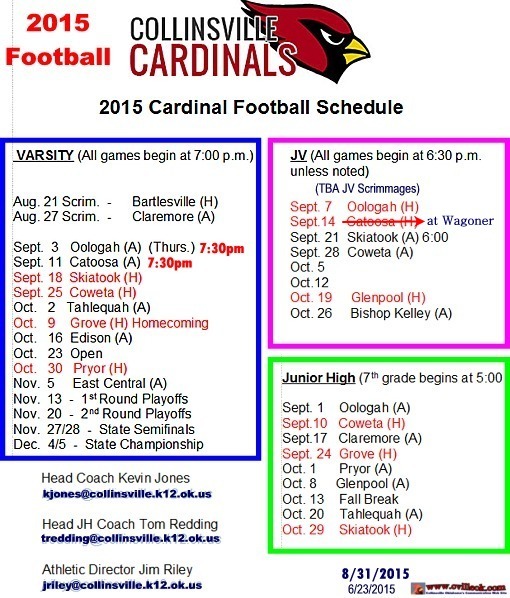 Collinsville was awarded the ball at the Skiatook 26. After a Skiatook coach on-field rant a flag was tossed and the ball moved to the nine yard line at 11:41 in the 4th. Three Sheaffer Smith carries (from the nine) put Collinsville into the endzone for the only time Friday night. The final rush (above) was from 3 yards out at 10:53 in the 4th quarter. Hadley's kick tied the score at 10-10. 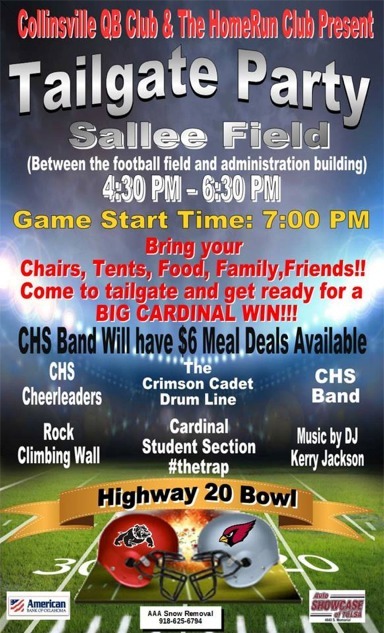 With the score tied Collinsville held Skiatook on the next possession (including a trick play attempt with a backwards bounce pass to a halfback who then threw long but broken up by the Cards). Skiatook's punt went into the endzone and the Cards started at their own 20 with 9:08 left. The Cards had moved out to the 48 yard line before Seth Boomer was sacked (above) back to the 32 bringing up 4th and 18 with 6:38 left. This is a wider view of the photo at the top of the page with Skiatook blocking Austin Roberts punt. It appears Josh Arnold (#43) was left with two players to try and block. Sheaffer Smith was first to the blocked punt and attempted to get positive yards but was stopped with Skiatook taking over at the Card's 17 yard line with 5:56 left. (Note: the score was 10-10 although missing bulbs in the home score looked otherwise). Before Skiatook kicked the eventual winning field goal (on 4th and 2 at the nine at the 3:48 mark) ... Brandon Lowe (#2) appeared to scope up a Skiatook fumble after a sideline tackle by another Cardinal and have a clear path to the goal ... but the officials ruled the ball down at that spot still in Skiatook's possession. The Collinsville Band tuned up and waited out the delay at the Education Service Center across the street from Sallee Field. Senior Kelli Edwards with some hands-on white.